UB History Prof. Patrick McDevitt explores the history of the man’s suit; arrive early for a pop-up exhibit of men’s fashion from the History Museum’s collection and a reception! Reception at 7pm, lecture from 7:30–9pm. Read more about this event on our blog. Join us for good food and conversation! This open book group will meet to discuss Jill Lepore’s The Secret History of Wonder Woman at the Sweetness 7 Cafe at 301 Parkside Ave. from 7:30–9:30pm. Buy local and get your copy of Lepore’s book in advance from Talking Leaves and get it signed at the Friday reading! Book signing/VIP event at 7pm at the Albright-Knox Gallery, followed by a reading and on-stage discussion of The Secret History of Wonder Woman at 8pm at the Albright-Knox Gallery. Read more about Jill Lepore and her book here. Preceded by a VIP event with Jill Lepore in person! This event builds on the free UB Gender Institute symposium, “Wonder Women and Super Men,” 9:00am to 6:00pm, Student Union Theater, UB North Campus. The full-day festival includes talks, conversations, and roundtables led by local faculty and experts. Also featured: a curated program of independent short films, live music, a drag break, kids tent, and, for all who buy tickets by Wed., Sept. 23rd, a free boxed lunch from the West Side Bazaar! 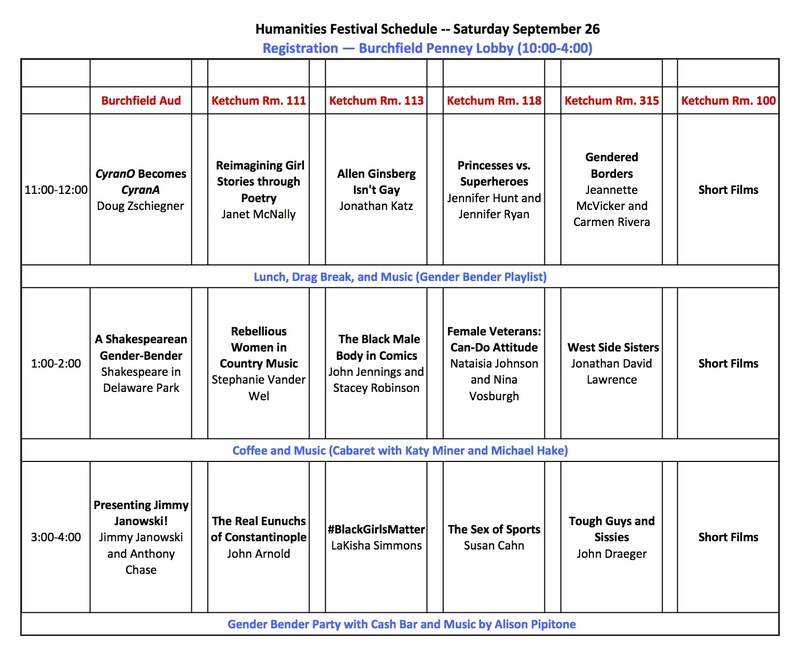 Daypasses to the Buffalo Humanities Festival allow entrance to the indoor festival events (held in the Burchfield Penney Arts Center and Ketchum Hall on the campus of SUNY Buffalo State).